Mount a Nortech Vacuum Generating Head on any standard 55-gallon drum (19-gauge minimum to prevent drum collapse) for instant, high-performance vacuum capability. Ideal for vacuuming up chips, dust, debris, liquids or sludge. Powered by compressed air, always dependable and trouble free with no motors or moving parts to wear out, Nortech Vacuum Generating Heads produce exceptional vacuum lift and vacuum flow while operating quietly and efficiently. Very high vacuum lift (D Venturi) and high vacuum lift (B Venturi) versions available. Factory installed options include Liquid Shutoff Assembly, HEPA Filtration, and Extra Silent Exhaust. 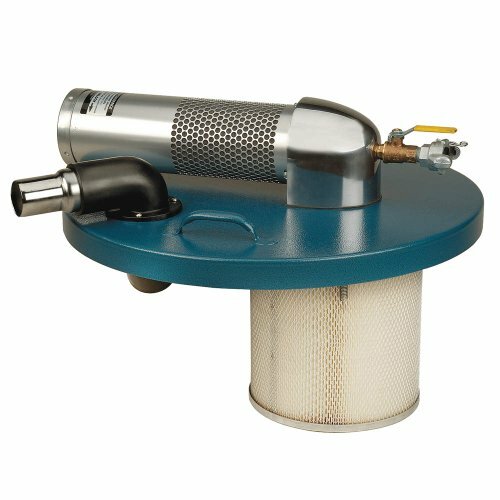 Features vacuum generating head with exhaust silencer, creates and produces high-volume suction quickly and efficiently, includes standard cartridge filter, and air shutoff valve with 3/4-inch fnpt inlet and chicago-style connector.